One dress, 16 possibilities. 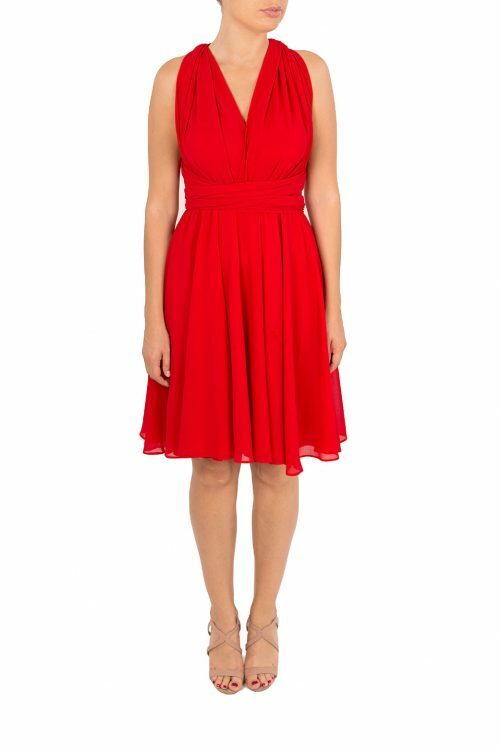 This short chiffon dress in red can be worn in a multitude of ways— Strapless, Backless, Off the Shoulder, Cap Sleeves and more! Wear this to any black tie event. Also perfect for dressing bridesmaids who can come in different shapes and sizes. Pick a colour or pick contrasting tones and let each pick the style most flattering to their shape. The versatility of this style also means that this is the bridesmaid dress that will get worn again. Limited stock available. If ordering multiple dresses, please allow 4 weeks for your order to be delivered. Please note that all sale of custom items are final. They are non refundable, nor exchangeable.